The Scott and Thomas streets intersection. Cash for traffic lights at Dandenong’s ‘Kamikaze Corner’ could be less than a year away. 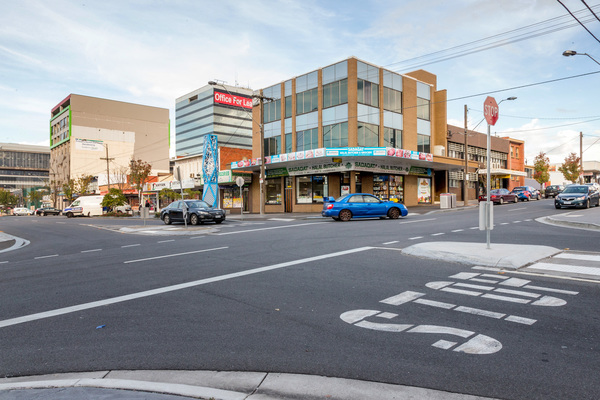 At their Monday 8 August meeting, Greater Dandenong Councillors voted to include a bid for signalisation at Thomas and Scott streets in streetscape works planned for the precinct. “I’m quite certain that users of the intersection … including myself … are happy to see that the council has brought it forward for consideration,” Cr Sean O’Reilly said. Cr Matthew Kirwan said problems with the intersection were regularly brought to his attention and traffic signals were the solution. “Splitter islands and additional signage have helped … but the problem hasn’t gone away,” he said. Cr Jim Memeti said the intersection hadn’t worked the way traffic engineers expected it to since a roundabout was removed and replaced with stop signs a few years ago. “I’m not sure if it’s the intersection itself or the drivers using it,” he said. “It’s very sensible of this council. On 15 June, the Journal reported that Cr O’Reilly queried how to navigate the intersection at the Tuesday 14 June council meeting. He asked for a report on the junction and the motion at the 8 August meeting was the result. His request followed a report in the Journal on 6 June that said nearby traders were witnessing collisions there daily. A long-time campaigner for lights at the intersection, Lamis Albyati, first contacted the Journal in August 2014 after frequently witnessing crashes from her nearby office. “Even if you are sure about yourself and that you’re doing the right thing, you’re not sure about the others, what they are thinking,” she said. An independent Road Safety Audit concluded the intersection met all relevant design standards. “The audit identified driver behaviour issues, with several motorists failing to stop, creating a safety issue for other road users,” it said. The council report said the roundabout was large to accommodate buses accessing a now-relocated interchange in Thomas Street, and facilitated faster vehicle speeds. “The large roundabout was a more hostile environment for pedestrians who were often forced to take risks in crossing the street,” it said. But there was one serious injury accident at the roundabout-controlled site in 2011, and there have been five casualty crashes since. “Further investigation of the details of these crashes identified all involved a vehicle failing to stop on Thomas Street and colliding with a vehicle travelling along Scott Street,” the report said. A recent road safety audit recommended splitter islands on Thomas Street and the council installed them, along with additional stop signs and pavement markings. ‘Rumble strips’ installed in July are expected to “provide a further cue to drivers on Thomas Street that they are approaching the intersection and to drive at appropriate speeds”. The council has also alerted Victorian Police to issues at the intersection and requested assistance. The report recommended further investigation of a proposed 40km/h CBD-wide speed zone.